Handicapped Scholarship:- Those Physically Handicapped students who are studying in Government school of Himachal Pradesh they are can get free education up to 12th Class. 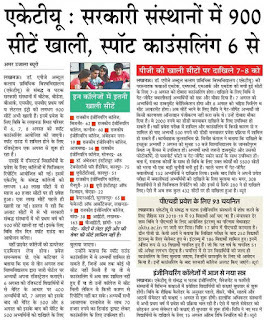 In July Last week Himachal Pradesh Government has made such a rule that can benefit Handicapped students not to depend on Parent money for study. Physically Handicapped scholarship in Himachal Pradesh is now merged under Central Govt, CBSE and State Board scholarship scheme that runs popular scholarship like Pre Matric, Post Matric, and Single Girls Child etc. 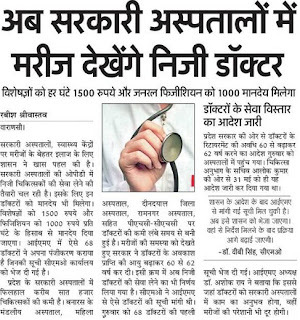 Private Doctor Jobs in Village UP Government soon recruit Chikitsa Mitra, Doctor, Physician and Private Nurse in all Government Hospital, Health Center on daily wage basis. This Private Medical Staff Recruitment in Uttar Pradesh will bring stability on Health, Reduce in Harmful disease etc. Government in a mood to take service of private doctor in OPD. Salary is also defined in press meeting of UP Cabinet. Private Doctor per hour wage of 1,000 to 1500 in which specialist reserved to Rs 1,500 per hour and Private Physician salary recruited on Rs 1,000 per hour. HCL Lucknow Recruitment 2018 HCL is Launching Campus Recruitment to General Candidates from any Degree and Diploma. The only you have to do is visit HCL Lucknow Office with Resume and face panel of through interview question at you. Chief Minister CM Aditya Nath Yogi already mentions to setup IT paper in Lucknow, Noida and Kanpur City. During Investor Summit of Uttar Pradesh held on July Last week, many Millionaires have promised to invest more than 60,000 Crore. BSNL Tower Installation BSNL Government Company has decided to Install More than 40,000 4G tower in all over India. The process BSNL 4G Tower Installation in Our Home, Khet, Apartment, and Restaurant is available in all zonal offices of BSNL Mobile Tower Installation. If you are international Traveler or Foreigner going to visit near future than i recommend you to buy sim of BSNL only because it is government approved and other network of India included Idea, JIO, Airtel etc work under TRAI (Telecom Regulatory Authority of India). CM Scholarship Rajasthan 2018 Recently Rajasthan Chief Minister Smt Vasundhra Raje Launched Mukhyamantri Ucch Shiksha chhatravritti Yojana. This Form is meant for grant applying under CMHE Scholarship for the Year 2018-19. Aspirant who are eager to pursue Higher Education after 12th Pass or Join any diploma polytechnic Course than he or she should submit the application who deemed to have accepted the terms and Conditions.